Part of the Best Western (didn’t know that when we booked it) it’s a very cute and friendly hotel. They have a patio with tables where you can sit, have a drink and/ or snacks, or you can chose to sit inside at the bar. In the mornings they have breakfast, available to all guests but charged to the room. Our room was spacious, equipped with mini bar (charged to the room if consumed), jaccuzi/ whirlpool. Bed was big and decoration goes perfect with the city. They have Wi-Fi, 24 hour front desk, and answer quickly if you have any problems or questions. It’s just 5 minutes, or so, walking, from the vaporato terminal, and just around the corner there’s a plaza with a bunch of restaurants and cafes. Great location. One thing we learned at the end of our stay is that this hotel is located in Lido, an island apart from Venezia, and the last stop of the water taxis. For this reason, it’s a more calm place than Venezia and great when looking for a relaxing stay. From the airport in Prague we took a bus, walked, then the vaporato (water taxi), then walked some more, and finally got to our hotel. My first impression of Venezia, to be honest, smelly!!! It was raining and, apparently, all the bad smell from the water (which everyone warns you about) came up. That, and how rude the vaporato guy was. Ugh! 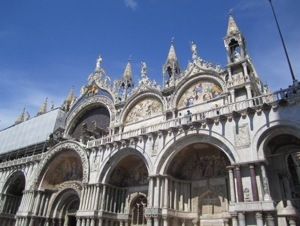 Finally at the hotel, we rested a bit and went to see Venezia. Rain had stopped, hotel staff showed us how to get to the water taxis faster, all was good again. Water didn’t smell anymore, we get to our stop and we are right in front of Piazza San Marcos. Here you are greeted by lots of vendors, but shopping can wait, go straight to the piazza (square), the principal square in Venice. Here you will enjoy beautiful Renaissance architecture, history, people watching, and all to the beautiful sound to the cathedral bells and mini orchestras playing at some of the cafes surrounding the square. From there, go, get lost in the streets of Venezia. Don’t be afraid, even when you think you won’t find your way back, you’ll see a sign, or the water, to guide you. If not, just follow groups of people, especially tourists, one of you is sure to find the way. Water taxis run until late so take your time, and enjoy the sights, the food, shops, eat gellatto, even ride in a gondola and, of course, take lots of pictures. 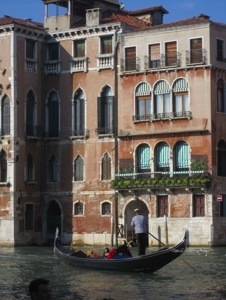 On your way back on the vaporato, look back and take in, one more time, the amazing, romantic view Venezia offers.